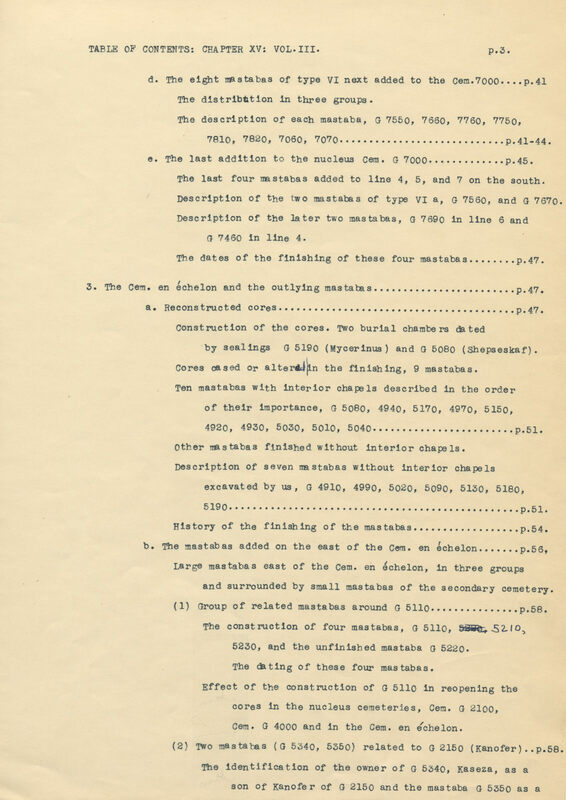 *The original, paper version of this page in “Chapter 15: Chronological Order of Finished Mastabas in the Giza Necropolis” can be found in archival box K14 in the Egyptian Section archives of the Museum of Fine Arts, Boston. Remarks Owner of G 2150. North and south false doors inscribed for Kanefer, identified as [jmj-r wpwt smr watj smsw js xrp aH] overseer of commissions, sole companion, elder of the is-chamber, director of the palace]; also appears in interior chapel relief (north, west, south walls), identified as [mdw kA-HD xrp aw xrp tmAtjw smsw js m prwj xrp mrwj nswt jmj-r pHw Hrj-sStA xAswt nbwt] herdsman of the White Bull, director of interpreters, director of bowcase bearers, elder of the is-chamber of the two houses, director of the two canals of the king, overseer of marshlands, master of secrets of every foreign land; in situ in G 2150. Interior chapel entrance door jambs (part of north door jamb: 32-12-8 = MFA 34.57; parts of south door jamb and small section of facade south of interior chapel entrance: 32-12-7 = MFA 34.58), and facade north and south of interior chapel entrance (block from north facade: 32-12-10) inscribed for Kanefer, identified as [Hm-nTr Sbk Sdt sA nswt mdw rxjjt jmj-jb n nTr=f] priest of Sobek of Crocodilopolis, king's son, staff of the commoners, he who is in the heart of his god; in situ in G 2150 (some loose blocks replaced in original position, others removed from site). Displaced lintel, no name preserved but probably belonging to Kanefer, identified as [jmj-r wpwt (smsw js) prwj xrp aw Hrj-sStA xAswt nbwt smr] overseer of commissions, (elder of the is-chamber) of the two houses, director of interpreters, master of secrets of every foreign land, companion; found in street east of G 2150. Drum lintel (Louvre C 155) inscribed for Kanefer, identified as [sA nswt jmj-r wpwt] king’s son, overseer of commissions; findspot unknown, perhaps originally from G 2150. Remarks Owner of G 5340. South false door upper lintel inscribed for Kasewedja; also appears in chapel relief (north and south walls); identified as [jmj-r wpwt xrp aw xrp sH] overseer of commissions, director of interpretors, director of the dining hall; in situ in G 5340. Possible son or grandson of Kanefer (owner of G 2150). Remarks Son ([sA=f] his son) of Kanefer (owner of G 2150). Appears in chapel relief (depicted as young boy), west wall of interior chapel, identified as [sS a nswt jmj-r wpwt] royal document scribe, overseer of commissions, and facade south of interior chapel entrance (32-12-7b = MFA 34.58), identifed as [jmj-r wpwt] overseer of commissions; west wall in situ in G 2150, section of facade found displaced, originally from in G 2150. Possibly same individual as Kasewedja (owner of G 5340).